In A world below, the students in Edgewood Middle School’s Grade 8 advanced placement class aren’t feeling all that psyched about their graduation field trip. The kids, from small-town New Mexico, expected a weekend in Albuquerque – but their teacher has chosen a day trip to the Carlsbad Caverns National Park. The 5:30 a.m. departure time isn’t helping matters. But once inside the caves, they have to admit it’s pretty cool. “The vaulted cavern ceiling stretched far overhead, covered completely with limestone formations and stalactites that loomed over them like the teeth of some monolithic beast.” Not long into the excursion, an earthquake hits, their teacher disappears, and the students are swept away by an underground river into a remote part of the caves – with no way out. 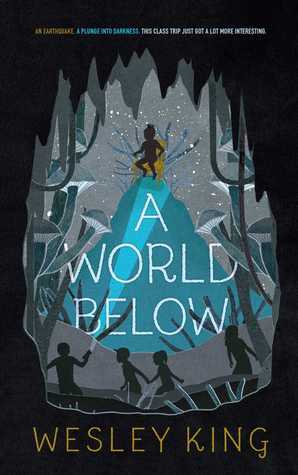 The premise alone promises that A World Below will be an action-packed middle-grade adventure novel. Yet author Wesley King adds another layer of danger in the form of the cave’s mysterious human inhabitants.